I have a digital camera Canon Power Short S5 IS. Not much of that, but not the last. Not "soap" in general. I decided to play around with a spherical panorama did. Almost got it. In addition the top and bottom. In general, turned out not spherical and cylindrical panoramas. Oh, and "dreary" that thing! ! ! I went about 50 and personnel, and to cover the top and bottom must be more than 60-minute training. So I decided to buy a wide angle converter (lens), but that does not know how many degrees it captures per frame. All that gives internet about this, I do not understand. Can someone thread Che thread knows about it? Share. And why spend money on a converter? Not cheap. was at the wide end of the EGF 36 mm and 27 mm will be. Corner diagonally to increase degrees 10. Expensive, no benefits panoramas. Little sense to have only a single frame in a limited space behind. converters usually write the transformation ratio. According to it, and can calculate a finite focal length. Only good converters x0, 22.. . x0, 33 do not produce and produce what does not hold water. I bought several different and immediately sold. True, there are not really bad converters Wide Angle. For example Nikon launches x0, 68. But it is also 18 - 20 frames spherical panorama. Here it is in the picture such a converter, adapter bolted to not mirror camera. As you can see, even in x0, 68 lens sticks out like Fisheye-a. This, incidentally, is the first sign of the correct converter. In converters for 20-50 dollars, which swamped the entire Internet, flat front lens. 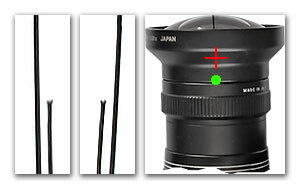 In any case, sooner or later, will have to buy a fisheye lens, so that you can remove the scope for a few frames. But less than $ 350 is difficult to buy something. Yes, more and SLR camera if necessary.